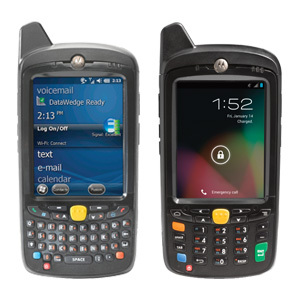 The Zebra (formerly Motorola) MC67 Rugged Barcode Terminal is a cutting edge mobile workforce barcode terminal without the problems of cutting edge technology. Based on the widely successful MC65 Mobile Computer, the MC67 is faster (OMAP 4 1ghz dual core), stronger (IP67 sealing and 8 foot MIL-STDG drop spec) and has improved wireless connectivity (G HSPA+ data chip and WiFi a/b/g/n). The MC67 is the right choice for mobile applications that are outside of the four walls or inside the four walls that would benefit from a QWERTY keypad. If data speed is an issue this is the go to device. The MC67 is the right solution for Transportation and Logistics delivery applications, Field Services inspection applications and virtually any other application that can benefit from this devices features. 3.5" Screen, 1D / 2D Imager, 802.11a/b/g/n, GPS, 4G HSPA+, No Camera, 512MB RAM / 2GB Flash, Qwerty Keypad, Battery, Windows Embedded Handheld 6.5 OS. 3.5" Screen, 1D / 2D Imager, 802.11a/b/g/n, GPS, 4G HSPA+, No Camera, 512MB RAM / 2GB Flash, Numeric Keypad, Battery, Windows Embedded Handheld 6.5 OS. 3.5" Screen, 1D / 2D Imager, 802.11a/b/g/n, GPS, 4G HSPA+, No Camera, 512MB RAM / 2GB Flash, DSD Keypad, Battery, Windows Embedded Handheld 6.5 OS. 3.5" Screen, 1D / 2D Imager, 802.11a/b/g/n, GPS, 4G HSPA+, 8 mega-pixel Camera, 512MB RAM / 2GB Flash, Qwerty Keypad, Battery, Windows Embedded Handheld 6.5 OS. 3.5" Screen, 1D / 2D Imager, 802.11a/b/g/n, GPS, 4G HSPA+, 8 mega-pixel Camera, 512MB RAM / 2GB Flash, Numeric Keypad, Battery, Windows Embedded Handheld 6.5 OS. 3.5" Screen, 1D / 2D Imager, 802.11a/b/g/n, GPS, 4G HSPA+, 8 mega-pixel Camera, 1GB RAM / 8GB Flash, Qwerty Keypad, Battery, Android 4.x OS. 3.5" Screen, 1D / 2D Imager, 802.11a/b/g/n, GPS, 4G HSPA+, 8 mega-pixel Camera, 1GB RAM / 8GB Flash, Numeric Keypad, Battery, Android 4.x OS. 3.5" Screen, 1D / 2D Imager, 802.11a/b/g/n, GPS, 4G HSPA+, 8 mega-pixel Camera, 512MB RAM / 2GB Flash, DSD Keypad, Battery, Windows Embedded Handheld 6.5 OS. 3.5" Screen, 1D / 2D DL Imager, 802.11a/b/g/n, GPS, 4G HSPA+, No Camera, 512MB RAM / 2GB Flash, Qwerty Keypad, Battery, Windows Embedded Handheld 6.5 OS. 3.5" Screen, 1D / 2D DL Imager, 802.11a/b/g/n, GPS, 4G HSPA+, 8 mega-pixel Camera, 512MB RAM / 2GB Flash, Qwerty Keypad, Battery, Windows Embedded Handheld 6.5 OS. 3.5" Screen, 1D / 2D DPM Imager, 802.11a/b/g/n, GPS, 4G HSPA+, No Camera, 512MB RAM / 2GB Flash, Qwerty Keypad, Battery, Windows Embedded Handheld 6.5 OS. 3.5" Screen, 1D / 2D DPM Imager, 802.11a/b/g/n, GPS, 4G HSPA+, 8 mega-pixel Camera, 512MB RAM / 2GB Flash, Qwerty Keypad, Battery, Windows Embedded Handheld 6.5 OS.